With the help of Brooklynite Sauce Money, Puff Daddy composed a song that conveyed just how large of a legacy the Notorious B.I.G left behind. Recorded literally months after B.I.G’s death, “I’ll Be Missing You” sees both Puff and Faith Evans go through the five stages of grief. As the song progresses, the relationship between Puff Daddy and B.I.G starts to shine; their partnership was always more than just a working relationship, built upon their friendship and belief in one another. Common’s Nobody’s Smiling features a weary, grief-stricken poet, reflecting on the state of affairs in his hometown of Chicago. A prevalent theme on the album is the disconnect between where he started and where he is now. 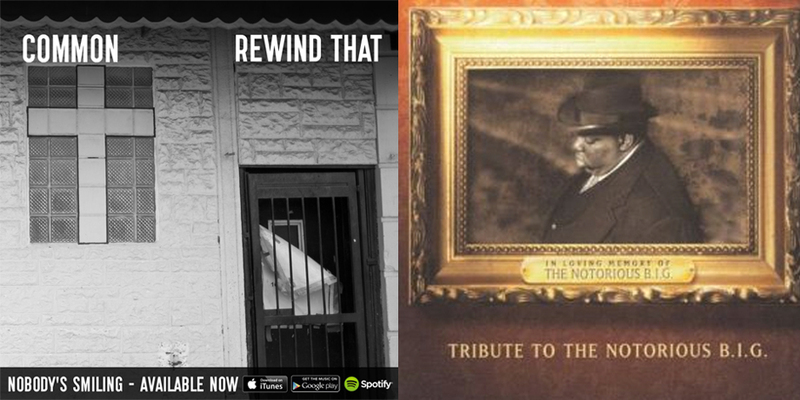 However, no other song plays into this state of reflection more than “Rewind That,” about how J.Dilla managed to change Common’s whole perception of music, and the impact his death left on him. Puff’s lyrics express survivor’s remorse as he can’t block out the visual of B.I.G’s untimely demise. Listeners soon realize that B.I.G’s unexpected and sudden passing has given his best friend real emotional scars. Meanwhile, “Rewind That” talks about Common’s shame as he can’t get the image of a deteriorating Dilla from his mind. Even worse, instead of being the supporting friend, Common kept his distance, further adding to his remorse. Eerily enough, the subjects of both songs released albums within days of their deaths. Life After Death was released 16 days after the passing of Wallace, while Dilla passed just three days after his magnum opus, Donuts, hit store shelves. Both projects would go on to gain critical acclaim. Puff promises to keep the Bed Stuy legend’s legacy alive, and offers a prayer that it will be Bad Boy`s poster boy who greets him into heaven. Likewise, Common manages to fulfill a heartfelt promise he made to Dilla regarding winning a Grammy and displaying it on a TV stand gifted to him from the Detroit native himself.